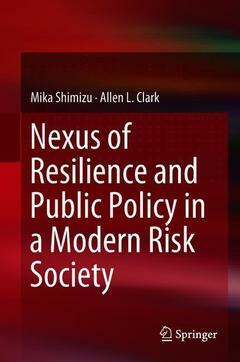 In response, this book integrates the latest theoretical insights on public policy and resilience and the latest practical analyses of case studies such as the Tohoku Disaster (Great East Japan Earthquake) in 2011 and Hurricane Sandy on the North American East Coast in 2012 to provide policy tools for future resilient societies and disaster risk management. The recent disaster cases illustrate that our changing, complex and uncertain risk environment requires far more resilience-based public policy through co-production of knowledge than is normally required for conventional disasters. By linking various fields and public policy, the book articulates a resilience-based public policy, i.e., the incorporation of resilience into various entities by designing and implementing ?linkages.? These include national-to-local linkages, linkages between different entities such as scientific communities and decision makers, and linkages between financial, human, and information resources. Thus, the nexus of resilience and public policy presented in this book aims at better public policy to face a changing and complex risk society, together with fundamental uncertainties at regional, national, and local levels around the world.